Syd Ironhand. (3 evolutions in all). On its last evolution: Rare. Pirates. Human. Mechanist. Spirit1. Attack 7/8. Defense 3. Health points15. Can attach Craftsmen Items to any character. At the start of the fight, choose one of your living Golems. 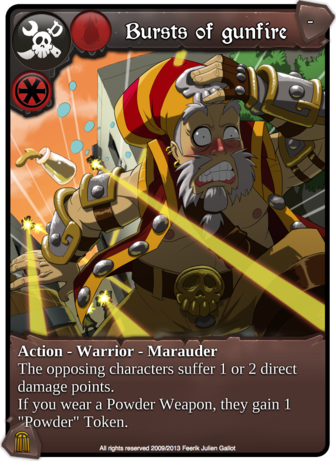 He gains 4 Health points and will then suffer the damage points “Syd Ironhand” would suffer. Turns 1, 3 and 5: Your Golems have Defense +2 for the following 2 turns and gains 2 Health points. Bursts of gunfire. Rare. Action. Pirates. Warrior. Marauder. The opposing characters suffer 1 or 2 direct damage points. If you wear a Powder Weapon, they gain 1 “Powder” Token. Ica-Rusty’s Mechanical Arm. Rare. Item Other. Pirates. Mechanist. Defense +1. Mechanist: Attack +2. If your character dies, this card is moved and attached to one of your living Golems determined at random. Permanent. Ica-Rusty. (3 evolutions in all). On its last evolution: Common. Pirates. Warrior. Golem. Mechanist. Spirit 0. Attack 5/8. Defense 3. Health points 14. Your Mechanists gain Chain if they play a Pirate Item. 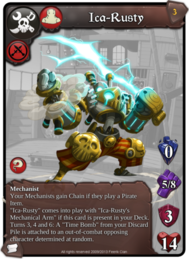 “Ica-Rusty” comes into play with “Ica-Rusty’s Mechanical Arm” if this card is present in your Deck. 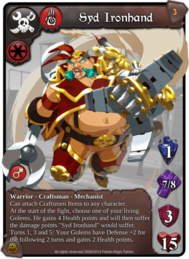 Turns 3, 4 and 6: A “Time Bomb” from your Discard Pile is attached to an out-of-combat opposing character determined at random. These cards are now available in the Newcomers Booster.